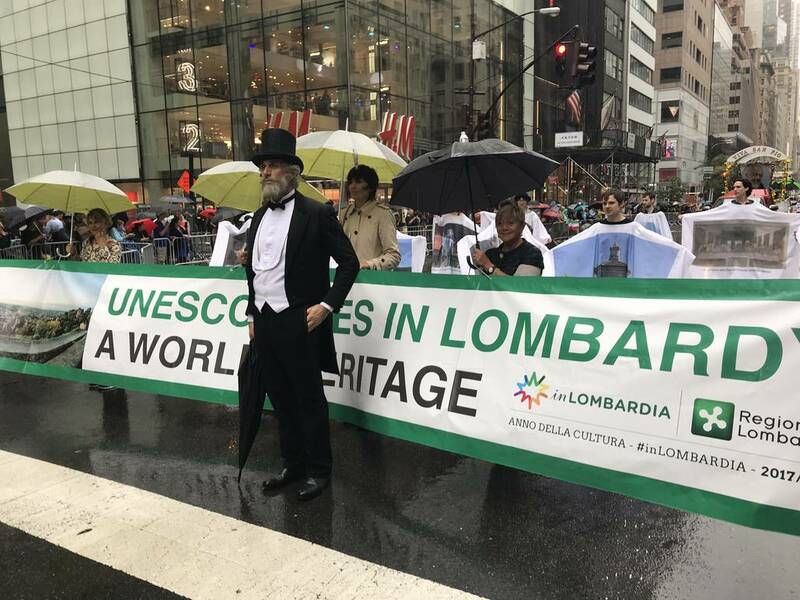 Spectators of this year’s Columbus Day Parade saw an unusual sight–Italian opera composer Giuseppe Verdi marching down the street, leading 12 of Italy’s world heritage sites. 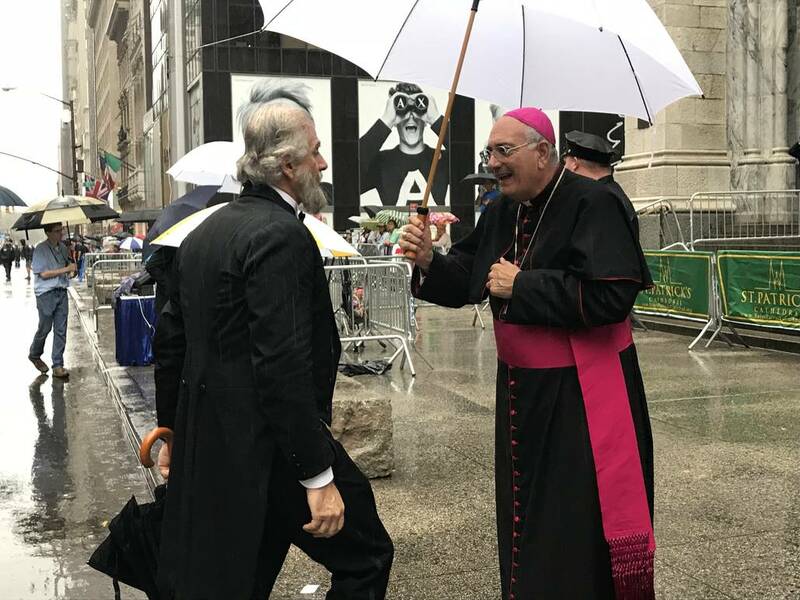 The idea was conceived by actor, director, and playwright Massimiliano Finazzer Flory, who appeared in the parade as none other than the opera composer himself. In order to get a better understanding of the public’s reception and what it was like to march on Fifth Avenue, i-Italy asked Finazzer to recount his experience. Can you tell us a bit about your recent trip to New York? Well, there are two different types of New Yorkers. Those who live there permanently and those who live there on a more temporary basis. But everyone always feels at home there. Paradoxically, the transient New Yorkers are perhaps more animated, adrenaline-filled, and full of vitality than the ones who live there permanently. In America there’s this sense of time. My life followed the rhythms of Columbus Day, the Metropolitan Club, MoMA, Pure Yoga, Barnes & Noble, and my film on Leonardo da Vinci, which is in post-production downtown. What did it mean to “wear” Verdi? Why him? Did people recognize him? “Wearing” Verdi meant wearing one of Italy’s three colors, in other words the history of opera, and as a consequence western music culture. More than ever in the next few years, Verdi will be the paradigm of reference between Europe and the United States. He’s the link between the generations that want to continue a certain idea of theater. 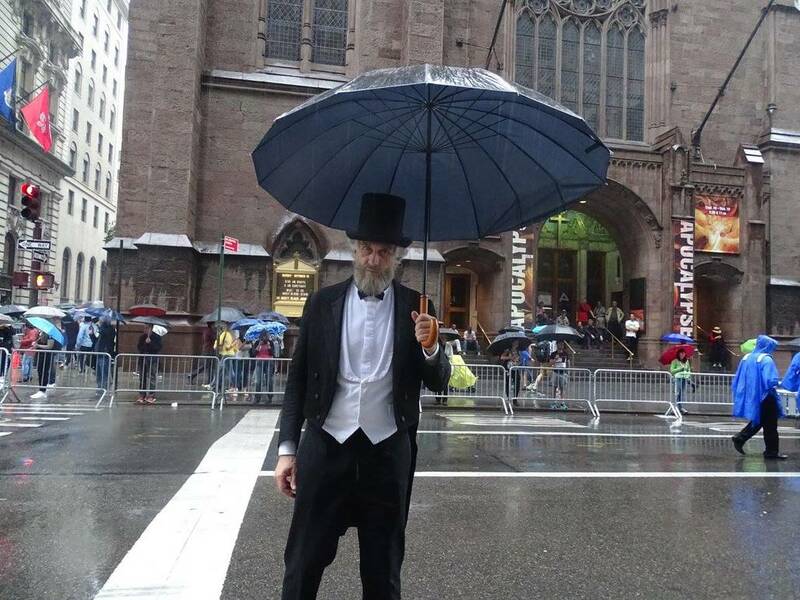 Americans might have mistaken me for Abraham Lincoln, but that mistake is actually fitting. They were both defenders of freedom. What did it feel like to march? Perhaps the rain made everything feel more real. 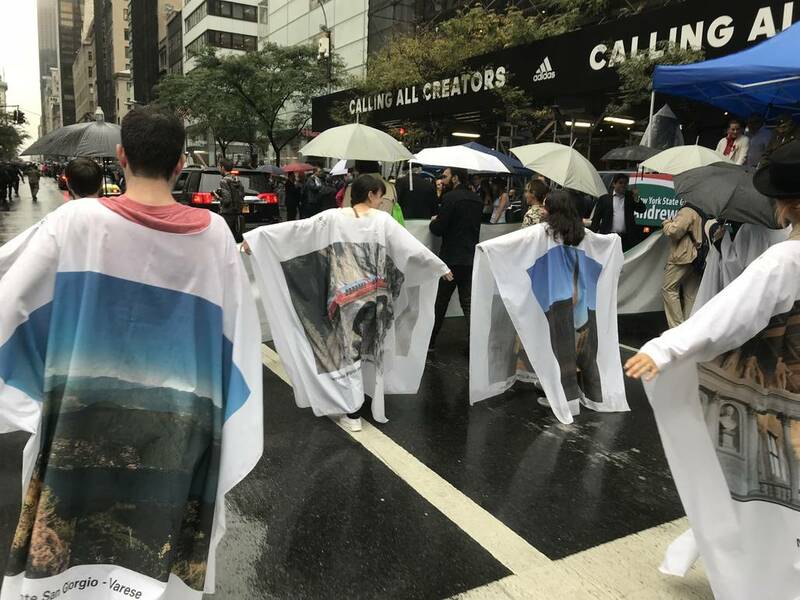 Reconquering Fifth Avenue with our bodies, flanked by Italian flags, means giving a human pace–and an aesthetic look on the world–back to New York, and to understand that Italy is worthy of this name when it goes beyond itself. What were the people’s reactions? There were a bunch of different feelings that came together. The ones that stood out were gratitude and, at times, affection, but you could also perceive these dreamlike thoughts toward us–as if Italy were still a place of the imagination. Who was part of the team you worked with in Milan? As a director searching for continuous creative connections, I like to put individuals together with different situations. The Fondazione Stelline and the Region of Lombardy, which both accompanied me and my assistants, found me 12 young New York artists. I taught them remotely in order to give life to a collective choreography. These artists are dancers, actors, and young directors who all have a passion for art. They make enormous sacrifices for this passion in order to survive in a cynical and egotistical world, much like the one we live in, which is stingy in recognition and resources. What does Columbus Day mean for an artist and intellectual like yourself? What do you think of the recent controversies, and what can a celebration like this do? Columbus Day is an “incomplete” event. A project with potential runs the risk of not developing completely if it looks towards the past. It doesn’t make sense to simply commemorate the past. You need to remain current and centered around a theme, which in my opinion should be “journey and discovery.” These are poetic and nonpolitical categories. This would involve transforming Columbus Day into a high-quality international mega event focused on excellence, representing it through a spectacular vision. The relationship between floats, groups, and authorities needs to be rethought, placing a serious request on the project. If I were the artistic director, I would be inspired by Fellini, and I would imagine something like Cirque du Soleil mixed with the Carnevale di Viareggio. Have you spoken about this with anyone in New York? Yes. I initiated some meetings with private partners to see how to invest in a moveable set for next year. Fifth Avenue is a set for performing arts, and this is possible thanks to the strong use of digital, creating bridges with media and cities between the United States and Italy. 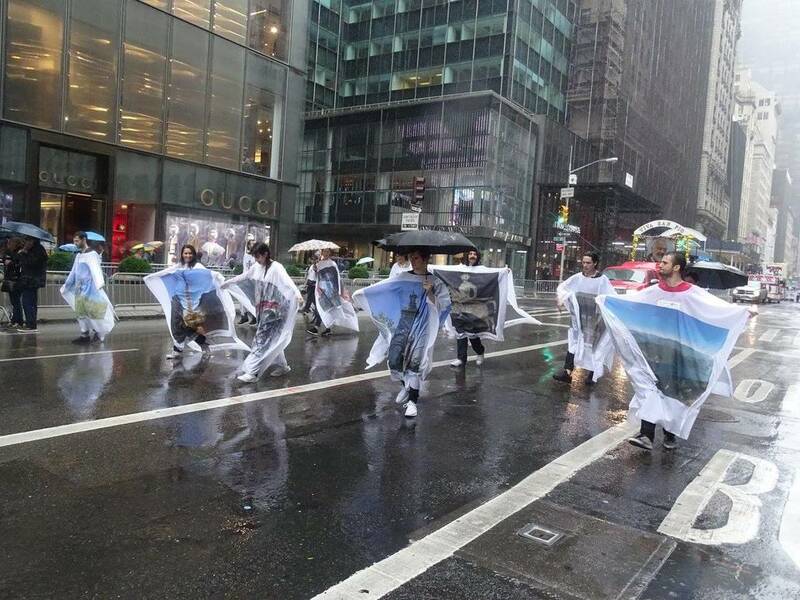 Verdi’s participation in the Columbus Day Parade was just a taste... What’s yet to come? Between the end of January and June, my Verdi show will have been in New York, Boston, Philadelphia, Washington, Chicago, and Miami. The sense of my operation is to present all the elements of the history of opera through a miniature theatrical work narrated by Verdi’s actual biography. This all with period costumes, music, singers, and, naturally, wordbooks. Thanks to digital media, this is all enveloped in a virtual set. What other projects do you have going on in America? We’re working intensely in post-production on the film Being Leonardo, which is drawn from my show and shot in New York, Vinci, Milan, and also by the Loire river. The goal is to participate, as a short film, in the most important festivals in the US during 2018. In the meantime, I’m making agreements with theaters and museums for 2019 for the occasion of 500 years since da Vinci’s death. Perhaps a futurist show on the NBA, but we’ll talk about this later.